Has anyone tried either of the Caronis shown below? I recently noticed them in a shop near me but wanted to check in with folks here before springing for one or both of them. The Exclusive Rums bottling has the benefit of being cask strength, but it is a year younger and $15 more, and the guy at the shop said he's tried both and prefers the AD Rattray. I bought the Caroni on the left because my whiskey dealer really enjoyed it. We are long past the point where anyone at that particular store tries to push garbage on me, so when the GM goes out of his way to recommend something to me I typically buy it. It could be some time before I open it though. Thanks, Eric. I remember you posting a while back that you had picked up that bottle but I wasn't sure if you had tried it yet. I think I'm just hoping someone will tell me that one of these stinks so that I'm not tempted to buy both. Unlikely, I know. I know the feeling. All I can tell you is that Caroni is a dead distillery. Depending on how much that matters to you, it might be worth pointing out that many of us wish we had loaded up on spirits from other dead distilleries when they were available for reasonable prices, even if half of the bottlings ended up being mediocre. Personally I'd just buy the one your store recommended if you are unsure, unless you do a lot of sample swaps or group tastings. That's a very good point. I always wish I had gotten into whiskey (and joined this board) a few years earlier so I would have been more informed when some now unobtainable things were obtainable. I don't know what existing Caroni suppoy looks like, but it's not increasing and bottles aren't going to get any cheaper. I have an open bottle of Rattray 16yr Caroni that I bought a couple of years ago. Can't say it distinguished itself as more interesting than any of the other Caroni bottles I have open. 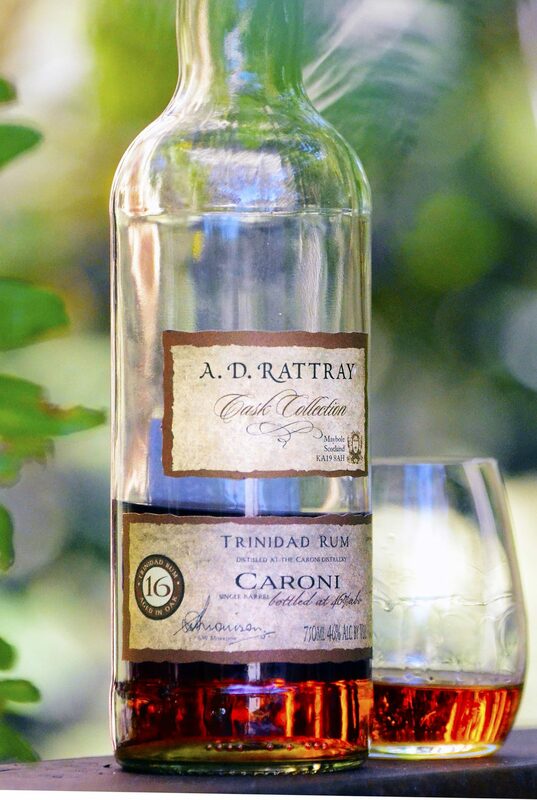 Caroni across the board has a very high funk (petrol, earth, oily, copper, hot) character and can be challenging but after several sips the best bottles reveal layers of flavor and reward the drinker with an interesting complexity. It's not an easy sweet smooth drinker nor is it much like Bourbon in that it's funk often overwhelms most of the barrel notes. The Exclusive bottle is barrel proof vs the reduced Rattray - If it were me I would spring for the barrel proof. Thanks for opining, sailor. I was hoping I'd hear from you. I was back in the neighborhood where the shop is last week and I ended up buying both, the Exclusive Rums version for myself and the AD Rattray mostly for a future group tasting (thought I'll only need about 10oz so I'll probably open it and sample it before then). I have an open Caroni 15yo bottled at 104 proof from Velier (I think) that is very nice, so hopefully at least one of these is in that ballpark. A Caroni question for you (and for anyone who knows): Did Caroni produce different types of rum? 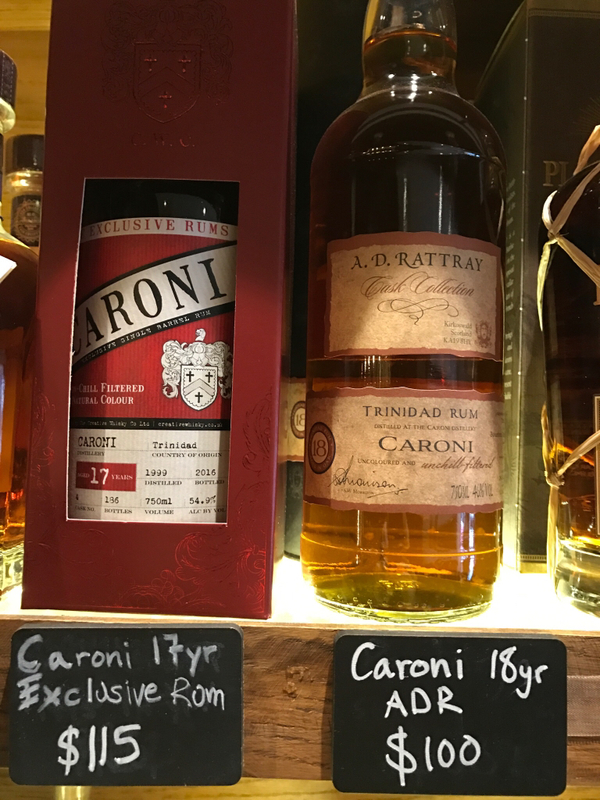 I see references online in reviews and on retailer websites to "heavy" Caroni rum, and I'm not sure if they're distinguishing those products, accurately, from lighter column-distilled rums also made at Caroni. I have been told by a well known rum distiller that Caroni is simply badly made column still product, hence the funk. OTOH I have seen posts on other sites where Caroni is described as a pot still product. Unfortunately I have no first hand knowledge. It certainly has all the characteristics of what I would think a pot still rum with badly done cuts would taste like, but I'm still learning. What I have read is that they used column stills primarily but did have a pot still as well (The distillery in St. Lucia is a bit like this, they have 2 column stills and three pot stills of various sizes including a moderate sized Vendome copper pot although they generally just use 2 of the pot stills). I have never been to Caroni or Trinidad for that matter (although I have sailed close by!) so I have no first hand knowledge of their stills either. But if they did have both it could be either or a combination of the two as St. Lucia does with some of their rums. I know nothing about this blogger but his information is one of the sources I remember reading that I could find quickly. He also seems to confirm what Steve was saying about trying to make a pot style rum on a column still and doing it poorly, or at least getting an unusual result, so it could be any or all of the above! Very interesting, thank you both. So it's possible that they were making "heavy rum" by distilling in a column still without reflux (or with very little). I'm not a rum or distillation expert by any means, but my thought is that the very unusual sooty diesel note in Caroni rums would have to come from the base fermentation material (molasses) combined with a low rectification still. This is mostly in line with what you were both saying, and what is included in the blog link from Bruce. Although, I once tasted spirit from a direct-fire pot still that tasted almost burned...not exactly the same funk that Caroni has but unusual nonetheless, and I believe it was caused by sediment from the mash in the bottom of the still being scorched. I started Googling as well and found a pamphlet that could perhaps be from a Caroni distillery tour or something? It's about halfway down this page of Capn Jimbo's Rum Blog. If it's accurate, it confirms that they had a two-column Blairs still (never heard of this type) and a pot still as of 1984. it also defines "light rum" and "heavy rum", indicating that they were making both, but doesn't say how they made each, leaving us to speculate further. If they were making both light and heavy rum, would they have blended the two before aging? My guess is that they did. I would think they would have aged different styles separately and blended them after they had been aging for awhile. Otherwise hard to know how much of each to use to get the profile you are seeking. I presume that is how Foursquare makes their blend of column and pot still rums. But I don't know for certain! Excellent point. That makes sense from the distillery's perspective. Now that all Caroni is in the hands of independent bottlers, however, do you think they have separate barrels of light and heavy rums and are mixing them to create a certain flavor profile? I would think it unlikely. Indeed they may have as much difficulty figuring out what they have in the first place as we do! Ha, true. So am I correct in surmising that the distillery likely blended much of the rum and re-barreled it before selling it off when they closed? Perhaps I'm a little hazy on how the closure happened, I only know that Angostura purchased a large stake. Just trying to figure out how the rum went from separately aging light and dark rums in the distillery's warehouse in 2002 to a blended light/dark rum in my bottle. Barrels may have been blended or reracked at some point along the way that are now being treated as a "single barrel" when sold now to independents. Like almost everything with rum figuring out what you really have in the bottle is likely to be a total crap shot. Thanks for the additional history Bruce. Some of these Caroni barrels must have seen some crazy stuff over the past 15 years. Also, I'm planning to open the Rattray bottle somewhat soon so I'll report back when I do. Had an opportunity to talk with Luca (the principal at Velier) about Caroni. He described going to the location only to find it shuttered with no staff and eventually finding a lonley caretaker who was happy to open one of the larger buildings. The sight of a huge warehouse full of older aging orphaned barrels brought tears to his eyes. When he eventually found the owners they were surprised that anyone wanted to buy any of the rum. Obviously he has no idea what was done as far as consolidation or mingling before he found them. In the meantime he has purchased a large guarded warehouse in Haiti where he is shipping younger barrels of rum from all over the Caribbean for further tropical aging. Wouldn't be too surprised to see some creative blends from Velier sometime in the future. Do you think it would be possible to do a private selection of a barrel of Caroni, or a custom blend? Or has demand for the distillery's rums become too high to make such a proposition feasible? This is a somewhat hypothetical question, but we DO seem to have a number of folks here who really like Caroni. Nice notes Kpiz, much appreciated. Is the 15 your referring to the Velier release? If so we found it relatively balanced also. This bottle has been open and about half empty for at least two years. Recently a friend stopped by and was captivated by it. I didn't recall it being that good so revisited this afternoon. It has certainly changed for the better with it's long exposure to air. Best description I can come up with is the rough edges that Caroni is noted for have been rounded and polished, the individual funky notes have morphed into something resembling a deep balanced unified whole. Still a steady funky back beat but the lead flavors are more lyrical and melodic. Moral of the story is - if you have a Caroni bottling give it some air time in the bottle. This still suffers from a lower proof than what I prefer but the oxidation definitely improved it. I recently ran across a few bottles of Exclusive Rums Caroni 19 year old in a local store. The bottlle and label is similar to the 17 year in the original post above. The price is $116, so I'm hesitant to buy without some further thoughts from the rum gurus in this forum. They also have an Exclusive Rums Nicaraguan 17 year old for $110. Has anyone tried either of these or have any thoughts on them? Likely to still have plenty of Caroni funk. I don't think that price is much higher than the 17yo bottles were. No idea on the Nicaraguan. Presume it is Flor de Cana that hasn't been manipulated. I don't think that price is much higher than the 17yo bottles were. No idea on the Nicaraguan. Presume it is Flor de Cana that hasn't been manipulated.